Run by an Irish/Italian Couple, Dabda is fast building up a well deserved reputation. This beautifully atmospheric Tapas wine bar will not disappoint. A real treat. This little fishing village is a 30 minute walk or a 10 minute taxi drive from Las Adelfas, down at the port you will find some wonderful fish restaurants. Do not leave Tenerife without a visit to Los Roques in Los Abrigos! Situated in the Las Adelfas 1 complex; There are two lovely outdoor terraces, one out front and the other overlooking the neighbouring pool at the rear or the premises. This is the ideal place to take the sun while relaxing with a pint. Live entertainment every night and all sporting events are covered. There is a traditional Irish cold room keeping the 10 different draught beers chilled! Authentic Irish bar where the bar counter (the longest in Tenerife) has been handcrafted from imported solid Irish oak. The Guinness is imported directly from Dublin, so authenticity is guaranteed! Live entertainment and all sporting events incl. hurling and gaelic football games. With both a breakfast & lunch menu providing very wholesome meals with freshly prepared ingredients and the best service in town, it's no wonder "The Wild Geese" has become a favourite with resident a visitor alike. The San Blas Commercial Centre is one of Golf Del Sur's gems. There are restaurants and bars a plenty within the complex and there is free entertainment every evening in the top and bottom squares of the centre. The marina has a range of restaurants and bars overlooking the ocean, there is also a clifftop walk along the seafront for a pre or post dinner stroll. Located at 22 Marcial Garcia, El Medano, this small but intimate Spanish Bar is ideally located on the harbour front. The balcony area to the back almost sits out over the sea with golden sand stretching as far as the eye can see. This combined with Spanish music in the background makes it an ideal location to chill out, have a beer or sample some of the genuine local food on offer. Phone: 661 743 994. Bus No: 470/483 from Golf del Sur runs approx every half hour or €15 in Taxi from Las Adelfas. This is a really nice restaurant situated 100 mtrs from El Timon Bar at 2 Marcial Garcis, El Medano, It also got a mention in the Lonely Planet guide on Tenerife. It specialises in fresh seafood, but has a full and extensive menu for all tastes. Prices are very reasonable and the food is really well presented. Makes for a great night out, booking is advised as it is a very popular location. Also serves lunches 6 days a week (closed Mon days). Phone: 922 178 220. 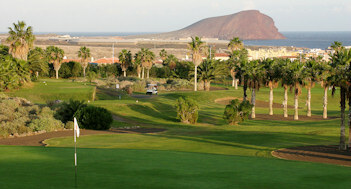 Bus No: 470/483 from Golf del Sur runs approx every half hour or €15 in Taxi from Las Adelfas.